Heat oven to 350°F. Line 12 regular-size muffin cups with paper baking cups. In large bowl, stir brownie mix, oil, water and eggs with spoon until well blended. Spoon about 1/4 cup batter into each muffin cup. Bake 32 to 36 minutes or until toothpick inserted in center of muffin comes out clean. Cool in pan 10 minutes. Remove from pan; cool completely, about 30 minutes. Spread cupcakes with frosting. 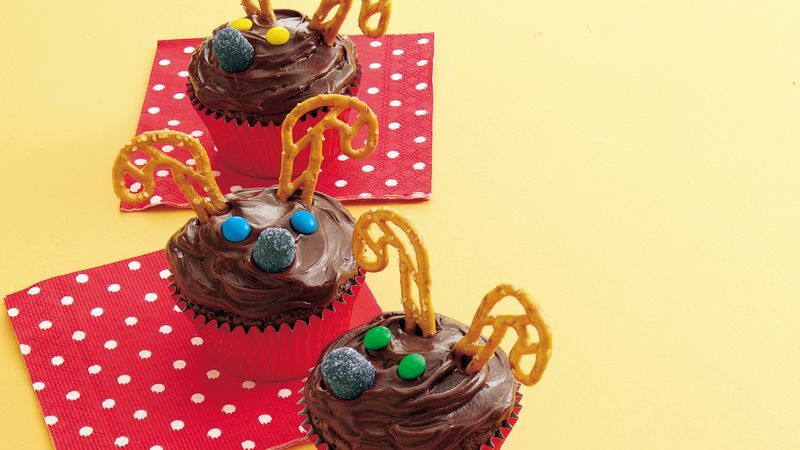 Decorate each with 2 pretzels for antlers, 1 red candy for nose and 2 baking bits for eyes. These cute cupcakes are perfect for bake sales, gift-giving or general merry making! Be sure to let the kids help!